Elvis Today: The Making Of "I'll Be Home On Christmas Day"
The other day I read on the ElvisMatters site that they had sent Michael Jarrett (writer/composer of the song “I’ll Be Home On Christmas Day”) a copy of the recent FTD release Elvis Sings The Wonderful World Of Christmas. A nice gesture, as this release includes no less than 16 outtakes of the two versions Elvis did of Jarrett’s song, six of them complete. Elvis Today: What was your overall reaction after listening to all the outtakes of "I'll Be Home On Christmas Day?" Michael Jarrett: I think for any songwriter that has the good fortune to have Elvis record their songs and; to be able some 40 years later to hear outtakes from the sessions is truly amazing. Hearing the process -the carving out- of my song is the fun part for me especially; after all, it's Elvis! Elvis Today: As a musician yourself, what do you think of Elvis approach to the song? Michael Jarrett: I believe he approached my song in his own special way, that is to say; he related to what the lyrics were saying and the overall sentiment the song conveyed to him during this time of his life. I believe he chose the song to record because it had personal meaning to him. Elvis Today: Before one of the takes, you can almost hear him cross out a couple of verses on his lyrics sheet as he mutters, "one, two, three ... let's see ..." How do you feel about him leaving out the verse about your children? Michael Jarrett: I had to laugh when Elvis said there were 8 verses, he was only joking of course. Actually, there were only 4, and when he recorded the one about my children I was completely surprised. I didn't know that he'd recorded this verse all these years until I heard the Alt. #9 version a couple of years ago. I'm happy the decision was made to leave out the verse about my children in the final version for two reasons: First being that; the song plays much better with just three verses with changing keys on the last verse to give the song lift and the build up to the ending with tagging the last part of the last verse; it just feels better to the listener I think. Secondly, Little John, Michele, Christine and Kelly weren't his children and leaving that verse out made the song more [his] song on a personal level ..
Elvis Today: On the remake of "I'll Be Home On Christmas Day," recorded one month later, Elvis wanted to give the song a more solid and heavy beat. How do you like the result? Michael Jarrett: I truly love both versions for different reasons. On that Christmas eve in 1969 when I wrote the song, I wrote it on guitar; which was more like Elvis' first version he recorded. When I was recording the demos at Gold Star recording studio in L.A.; to give to Joe Esposito, I played "I'm Leavin" on guitar and decided to try "I'll Be Home On Christmas Day" on the piano. Strangely enough, I'd never played it on the keyboard before that day and sat down to give it a shot and played it through one time in a slow bluesy shuffle. After I'd finished, the engineer in the control room said, "come in and listen to this" .. "listen to what", I said? Unknown to me, the engineer had recorded my run through of the Christmas song without me knowing it .. [an old trick many engineers use to get the best out of a player; when they don't know they're being recorded]. After listening to the play back we felt it was a good take 'straight from the heart'. So off it went, along with "I'm Leavin" to Joe Esposito and on to Elvis. I think they liked the original bluesy shuffle .. just a guess on my part since they went back a month later and rerecorded it in that style. I do love both versions as they are heart felt. If I had to pick between the two, I would chose the first version because it's more "up close and personal". Elvis Today: Finally, it must be a great experience to be able to listen to Elvis working with your song, after so many years. What do you think about the idea of releasing outtakes from Elvis recording sessions like this? Michael Jarrett: This is an easy question and very simple to answer. For this songwriter, It's exciting beyond words to hear the King himself talking about and working up a song I'd written so long ago that is now part of Elvis' history .. Thank you Elvis for letting us eavesdrop into your world in the making of this wonderful Album of Christmas songs ..
And thank you Thomas, for helping to keep Elvis' music and memory alive for future generations ..
My best to you and all the Elvis fans and Happy Birthday to The King!! Fantastic interview, Thomas. I always enjoy hearing Jarrett's thoughts. He wrote two of Elvis' best songs. If only Elvis had recorded more by him. I agree with Troy, excellent questions (and answers!) and Michaels's two songs are among the best Elvis ever recorded. Very interesting to hear about the demos and Michael's thoughts about the different versions, and Elvis leaving out the extra verse. Thanks, both of you! 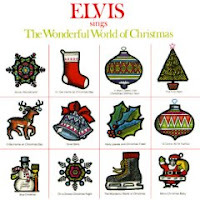 And I agree, "I'm Leavin'" and "I'll Be Home On Christmas Day" are certainly among the best songs Elvis recorded. Hi, Thomas, nice blog, very well done as usual. I really enjoyed answering your questions and revisiting a time in my life that changed so much for me. Elvis left us a huge part of himself through the music he recorded and the videos and movies we have of him .. his star shines as bright as ever for all eternity. Hi Michael, and thank you so much for sharing your thoughts about the two versions Elvis did of your song "I'll Be Home On Christmas Day." I really appreciate it. And thanks for writing two of Elvis' best songs!